To help SWA members, and non-members, further their craft and build their writing careers, is one of the primary aims and objectives of SWA. 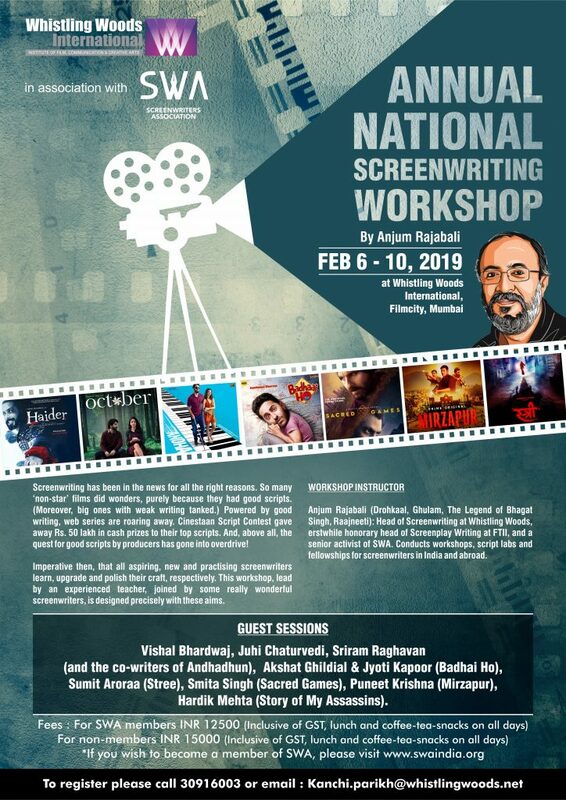 Mumbai based film school Whistling Woods International, in association with SWA, is organising 5-Day Screenwriting Workshop, conducted by Anjum Rajabali (veteran screenwriter and senior EC member of SWA) from February 6-10, 2019, at WWI Campus. Screenwriting has been in the news for almost all of 2018. And, for all the right reasons. Several ‘small’ non-star-driven films performed fabulously, purely because they had wonderful scripts. (Some big ones tanked, owing to weak writing.) Web series, powered primarily by good writing, are making waves continuously. The first edition of Cinestaan India’s Storytellers Script Contest rewarded five new screenwriters with cash prizes totaling Rs. 50 lakh! (The second edition is open right now.) And, of course, the quest for good scripts by studios, production houses and web platforms is going into overdrive. Imperative then, that more people take to this craft, and equally important that we continue to polish and upgrade our skills. This workshop covers both these objectives: Guide new writers into kick-starting their screenwriting seriously, and also serve as a refresher to practicing writers. , by interacting with the workshop instructor and the other guests who will come to share their writing experiences. For both kind of participants, it should be an enriching experience. – How does one formulate the CENTRAL IDEA for a script, and draw dramatic power from it to fuel the full narrative? How does it continue to open up, creating challenging twists for the characters? – Developing this central idea into a PLOT. What is a good plot? How the action plot facilitates the thematic or emotional plot to emerge and bloom. – CHARACTER – the factor that gives life to your story and script, thereby making the viewing experience an involving one. How does one encourage the viewer to develop a bond of empathy with the characters such that the viewer begins to feel for them. Creating interesting but credible characters. – Often a wonderful story, with interesting characters, falls flat because the STRUCTURE of the screenplay was problematic. Hence, it’s essential for us to be mindful of the design that we’re giving our scripts. – If everything else works, but the SCENES are not crafted well, the entire effort takes a toss. We can learn from good examples how scenes can be crisp and impactful, and develop our own style for achieving that. – Last, but obviously not the least – DIALOGUE! Difficult to be taught this, but every screenwriter will have to come up with crackling stuff here. Once again, examples can be inspiring, and a great source of learning. – Archetypal characters and conflicts from MYTHOLOGY continue to find centrality in modern scripts. So, it will certainly help to examine what is mythology really about, and why does it exercise such influence on our imagination, and how does it actually help and enrich our screenwriting. – Today, a professional screenwriter has to be a quasi-lawyer! There will be a substantial session on COPYRIGHT LAW, on WRITERS’ RIGHTS, on CAREER GUIDANCE & STRATEGY (especially on how to approach producers, conduct meetings, etc.). We shall bring in agents and a lawyer, plus a senior official of SWA to guide you and answer all your queries. – This time we have five GUEST SESSIONS with special writers like Vishal Bhardwaj, Juhi Chaturvedi, Sriram Raghavan (and the co-writers of Andhadhun), the writers of Badhai Ho and Stree, and three writers of web series – Smita Singh (Sacred Games), Puneet Krishna (Mirzapur) and Hardik Mehta (The Story of my Assassins). This entry was posted in Notices on January 15, 2019 by SWA Editor.